Download "Decision Tree Learning on Very Large Data Sets"
3 accuracy of the tree is not affected by adding training examples. They used C4.5 release 5 (which does not use a penalty term for continuous attribute splits) and tested several pruning algorithms. They found that only error complexity pruning was (in some cases) able to keep tree size in check when there was no increase in accuracy with additional training examples. We found that the trees were much smaller using C4.5 rel. 8 and that for the Australian data set [3 ] using pessimistic pruning accuracy was still slightly growing as tree size grew. However the trend of larger trees with more train examples and no increase in accuracy pointed out in their papers is of concern. Figure shows a decision tree turned into a set of rules by simply following paths to leaves with simplifications of removing subsumed conditions. The rules can be created from pruned or unpruned trees. Rules can be pruned separately from trees. An approach included with C4.5  to pruning rules is so time intensive [7 3] that it may also require parallelization for large train set sizes. Rule pruning does not necessarily fix the problem of larger train sets giving no increase in accuracy over smaller training sets but larger rule sets . We are experimenting with the generation of rules from pruned trees. The simple experiments reported here discuss results from pruned and unpruned decision trees. 3. Combining rule sets Under the paradigm explored in this paper a single training data set will be broken into n subsets. A decision tree will be learned from each of these n subsets in parallel. Rules will then be generated from the decision trees. These rules will be combined into one rule set. In the proceeding we assume that two rulesets at a time are combined. Rules can be combined by simply taking the merge of the n rules sets into a new rule set. However there may be rules that conflict. That is two rules may match a specific train example but put the example into different classes . These conflicting rules must be resolved. There may also be rules which have the same number of conditions and put examples in the same class but have different values for the conditional tests. These rules can be merged into one rule. Our approach to rule conflict resolution is based on Williams work  where multiple decision trees each with a different bias (e.g. choose a nominal attribute over a continuous attribute for node splitting in the case of a tie in utility) were generated from the same data set. Rules were generated from the different trees and then combined into a single rule set. The first step in conflict resolution is to scope continuous attributes by finding all rule pairs which U have the same number of antecedent conditions and U have one or more attributes that are the same but the continuous value chosen for the test is different (e.g. length 5 and length 5.7 ). If the attribute test is then the smaller of the two rule values is used (e.g. length 5 and length 8 results in length 5 as the condition of the combined rule). If the attribute is then the larger of the two values is used in the combined rule. The second step is to identify all pairs of rules that have all but one condition the same and have different classes on the right hand side. These rules are considered to be in conflict. Assume the following two conflicting rules r: p 0.6 & p4 4.9 V class and r2: p 0.6 & p2 V class2. Each rule will be strengthened by adding the negation of the conflicting condition to the rule. The negation of the condition p2 is p2 making the new rule nr: p 0.6 & p4 4.9 & p2 V class. Similarly the new rule 2 is nr2:p 0.6 & p2 & p4 4.9 V class2. Now examples that have attribute values p 0.6 & p4 4.9 & p2 triggered one (or both) of the two original rules (r and r2) before they were strengthened but no longer do so. Hence the next step is to restore the lost example coverage. If all the conflict examples that match the conditions above are of one class (e.g. class) then introduce the rule: nrc: p 0.6 & p4 4.9 & p2 V class. If the examples that match these conditions are of mixed classes find a new condition (for continuous attributes an attribute and split point) that partitions the examples into pure subsets. If one cannot be found take the best test and add it to the rules. There will now be two new rules for these conflicting examples: nrc: p 0.6 & p4 4.9 & condn V class nrc2: p 0.6 & p4 4.9 & W condn V class2. Next eliminate any redundant conditions in individual rules. For example in rule rr: p4 0.6 & p3 5 & p4.4 V class the condition p4 0.6 is redundant since it is subsumed by the last condition. Now repeat Step 2 to find if new conflicts have been introduced. When Step 2 finds no new conflicts go back and repeat Step. Then merge the two rule sets together and eliminate any redundant rules that have been created by the process of removing conflicts. 5 Table. Results on the Iris data set using 0-fold cross-validation. With rule ordering by accuracy and by specificity. Rule C4.5 % Unpruned % Pruned % Order Correct Correct Correct Accuracy 95.3% 95.3% 95.3% Specificity 96% 96% conditions in the antecedent were put first) with the rule accuracy used to order rules of the same specificity. This was done because rule accuracy is not recalculated after conflict resolution and is only an approximation of the accuracy on the train set. As shown in the second row of Table one less error was made with the specificity ordering approach. 5. Summary In the approach to learning from large training sets discussed here a data set is broken into n subsets. A decision tree is generated on each of the n subsets and rules are generated from the decision tree. The rule sets will then be combined into a single rule set with conflicts among rules resolved. This approach might also be used by agents which learn rules from examples and then want to share knowledge. Initial tests on the Iris data set are promising. The cross-validated results are the same as or better than those obtained using C4.5. Currently we are testing on larger datasets using more partitions of the data. We also plan to conduct experiments on the DOE s ASCI Red parallel computing system . Acknowledgements: This research was partially supported by the United States Department of Energy through the Sandia National Laboratories LDRD program contract number DE-AC04-76DO References  ASCI Red Users Manual  L. Breiman J.H. Friedman R.A. Olshen P.J. Stone Classification and Regression Trees Wadsworth International Group Belmont CA  P. Chan and S. Stolfo Sharing learned models among remote database partitions by local metalearning Proceedings Second International Conference on Knowledge Discovery and Data Mining pp  P. Chan and S. Stolfo On the accuracy of Meta- Learning for Scalable Data Mining Journal of Intelligent Information Systems V. 8 pp  R.A. Fisher The use of multiple measurements in taxonomic problems Ann. Eugenics V. 7 pp  W.P. Kegelmeyer AVATAR  R. Kufrin Generating C4.5 Production Rules In Parallel Proceedings of the Fourteenth National Conference on Artificial Intelligence (AAAI-97) Providence RI pp July 997. 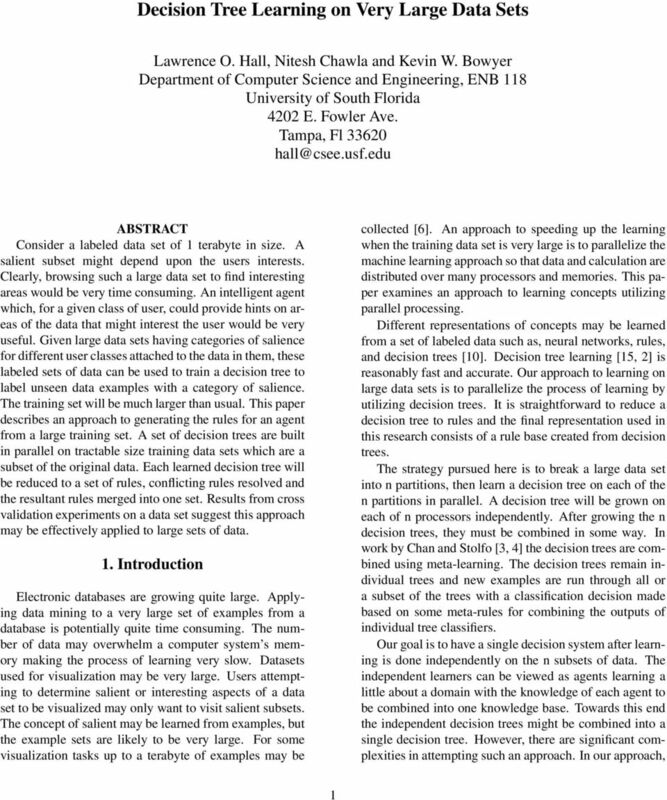 J. Mingers An Empirical Comparison of selection methods for decision tree induction Machine Learning 3 (4) pp  J. Mingers An Empirical Comparison of pruning methods for decision tree induction Machine Learning 4 (2) pp  T.M. Mitchell Machine Learning McGraw-Hill N.Y  C.J. Merz and P.M. Murphy UCI Repository of Machine Learning Databases Univ. of CA. Dept. of CIS Irvine CA. Machine readable data repository mlearn/mlrepository.html. 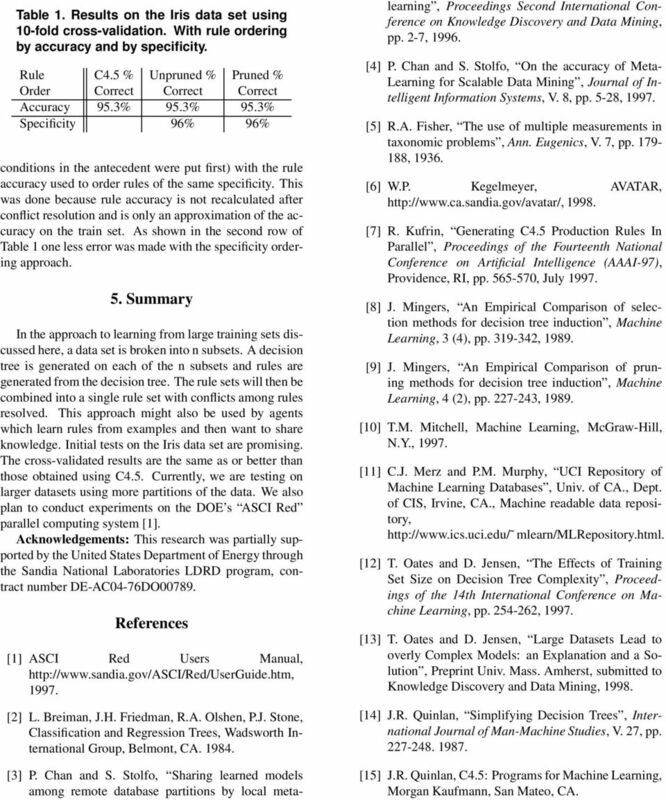 T. Oates and D. Jensen The Effects of Training Set Size on Decision Tree Complexity Proceedings of the 4th International Conference on Machine Learning pp  T. Oates and D. Jensen Large Datasets Lead to overly Complex Models: an Explanation and a Solution Preprint Univ. Mass. Amherst submitted to Knowledge Discovery and Data Mining 998. 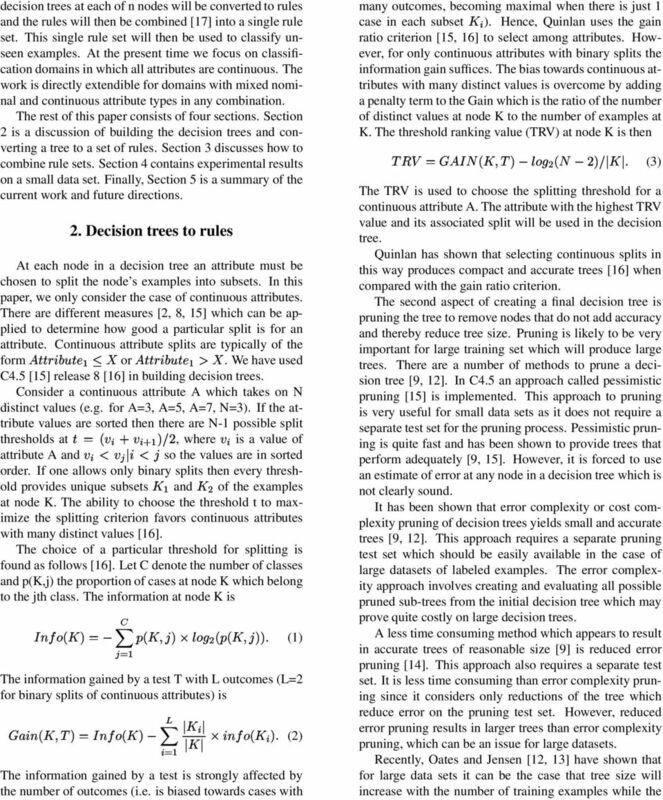 J.R. Quinlan Simplifying Decision Trees International Journal of Man-Machine Studies V. 27 pp  J.R. Quinlan C4.5: Programs for Machine Learning Morgan Kaufmann San Mateo CA. 6  J.R. Quinlan Improved Use of Continuous Attributes in C4.5 Journal of Artificial Intelligence Research V. 4 pp  G.J. Williams Inducing and Combining Multiple Decision Trees PhD Thesis Australian National University Canberra Australia 990. From: AAAI Technical Report WS-97-07. Compilation copyright 1997, AAAI (www.aaai.org). All rights reserved. Credit Card Fraud Detection Using Meta-Learning: Issues 1 and Initial Results Salvatore 2 J. D A T A M I N I N G C L A S S I F I C A T I O N FABRICIO VOZNIKA LEO NARDO VIA NA INTRODUCTION Nowadays there is huge amount of data being collected and stored in databases everywhere across the globe. 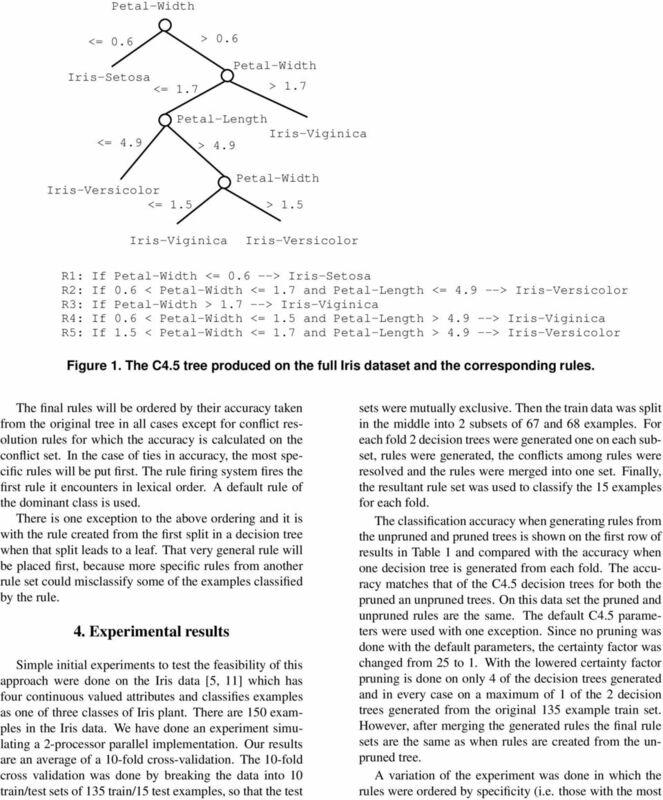 Classification/Decision Trees (II) Department of Statistics The Pennsylvania State University Email: jiali@stat.psu.edu Right Sized Trees Let the expected misclassification rate of a tree T be R (T ). Three types of messages: A, B, C. Assume A is the oldest type, and C is the most recent type.